This entry is part 3 of 11 in the series Creating My Smart Home. One of my goals for creating a smart home is to keep things as “guest friendly” as possible. With that in mind I decided to go with Z-Wave switches to control the lights and fans in our common areas (kitchen, family room, etc.). These switches work just like a regular switch–perfect for guests–and they can also be controlled and automated with Home Assistant. The documentation for Z-Wave on home-assistant.io is pretty good, but I found myself unsure how to proceed in a few places and had to find advice in the community forums. Mostly it amounted to restarting Home Assistant or rebooting the Raspberry Pi if Z-Wave devices didn’t show up the way they should. I wanted to document the steps I took here to make this process a little less involved in the future. 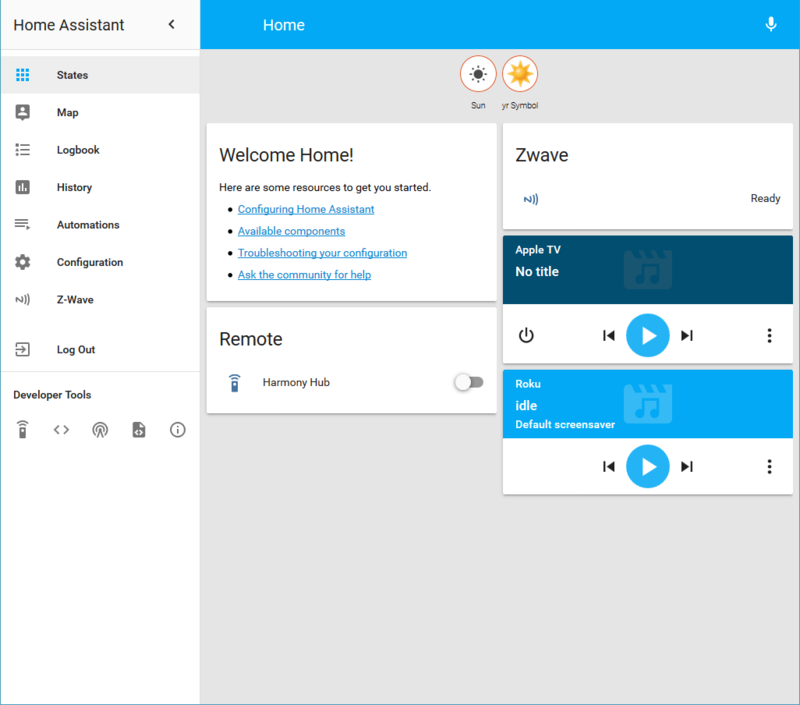 I’m currently running Home Assistant v0.48 with the Hassbian v1.23 image. Also note that I’m using an Aeotec Z-Stick Gen5 USB adapter to control my Z-Wave devices; this is well-liked by the Home Assistant community and seems to be a popular choice. Then switch to the “homeassistant” user and edit the configuration.yaml file. Add a zwave section to configuration.yaml and set the usb_path to the Z-Stick. 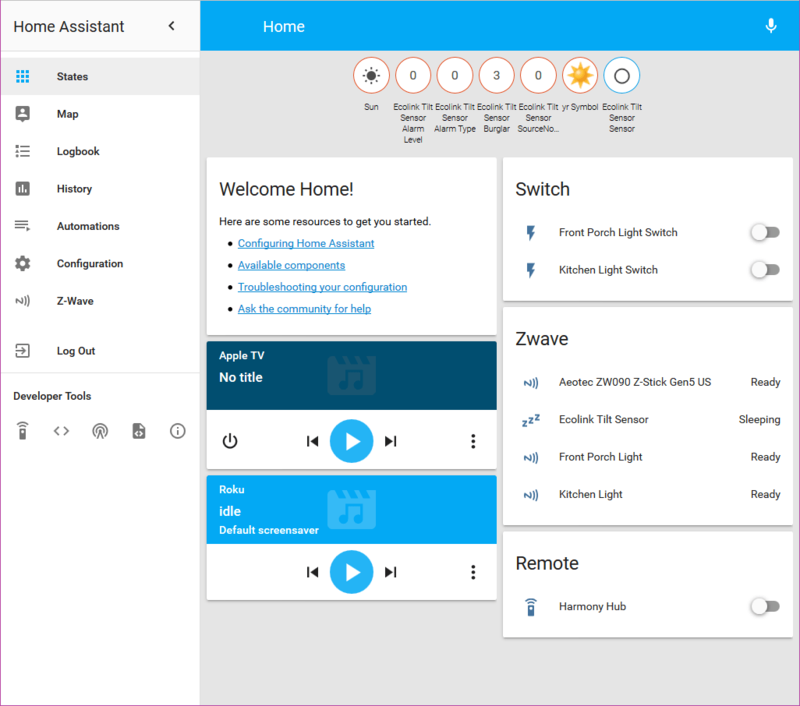 A Zwave group will be visible in the web UI, but may not have correct names for the Zwave device(s) yet. After a second restart, Home Assistant should display correct information for each Z-Wave device. At this point go ahead and add any other Z-Wave devices you have using the Z-Stick instructions. I just unplugged the Z-Stick from the Pi and carried it around to each device to add them; one of the great features of the Z-Stick is that it has an internal battery and you can carry it around unplugged. Make sure you plug it back into the same USB port when you’re done adding devices. Once additional devices are added you may need to restart Home Assistant or the Pi itself for them to show up correctly. Another potential issue is with “sleeping” Z-Wave devices. Notice in the screenshot below that one of the devices is “sleeping” and has no name. You may need to wait for sleeping devices to wake up before Home Assistant can display them properly. In this case it was my Ecolink garage door tilt sensor and I had to wait almost an hour before it showed up correctly. Sleeping devices may not appear correctly in Home Assistant until they wake up. After they wake up, Home Assistant knows more about sleeping Z-Wave devices and can display them correctly. As of version 0.48 of Home Assistant, Z-Wave entities may have IDs that are the same and therefore conflicting. 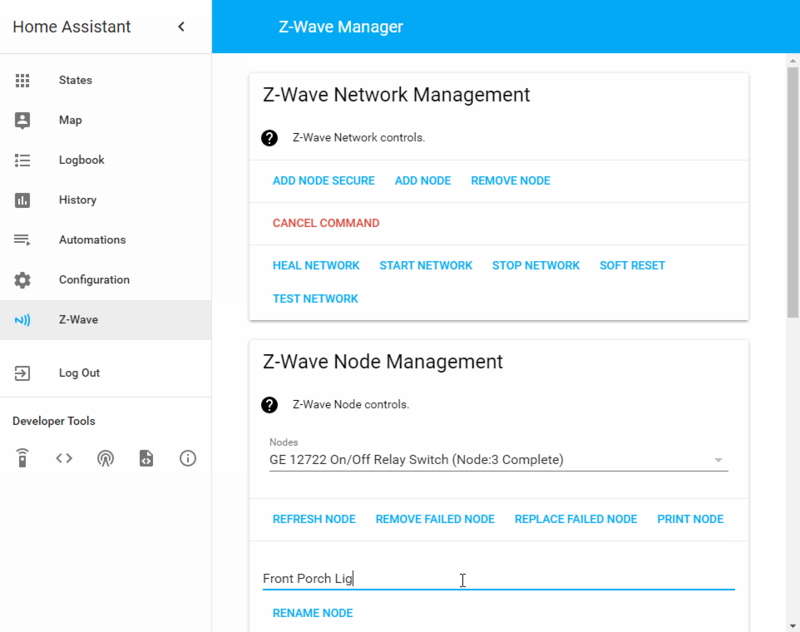 It’s a good idea to open the Z-Wave panel from the left menu and rename each Z-Wave node to something unique and descriptive. Rename Z-Wave nodes to something unique and descriptive to avoid ID conflicts and so using them when creating automations, scripts, etc. is easier. Unplug the Z-Stick from the Pi (remember the USB port it was plugged into!). Take it near the new Z-Wave device and add it per the Z-Stick documentation. 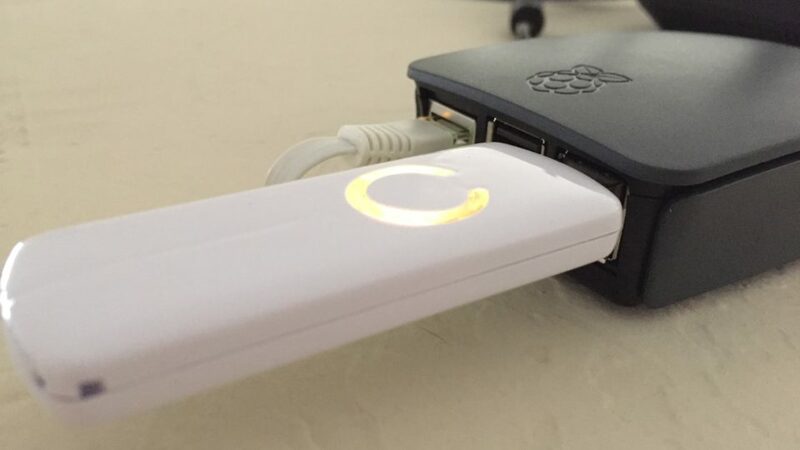 Plug the Z-Stick back into the Pi using the same USB port. Reboot the Pi, wait for Home Assistant to initialize, and see if the new device shows up in the web UI. If the new device is not named properly, restart Home Assistant. It should now be named properly. Rename the node for the new device before using it in any groups, automations, scripts, etc. 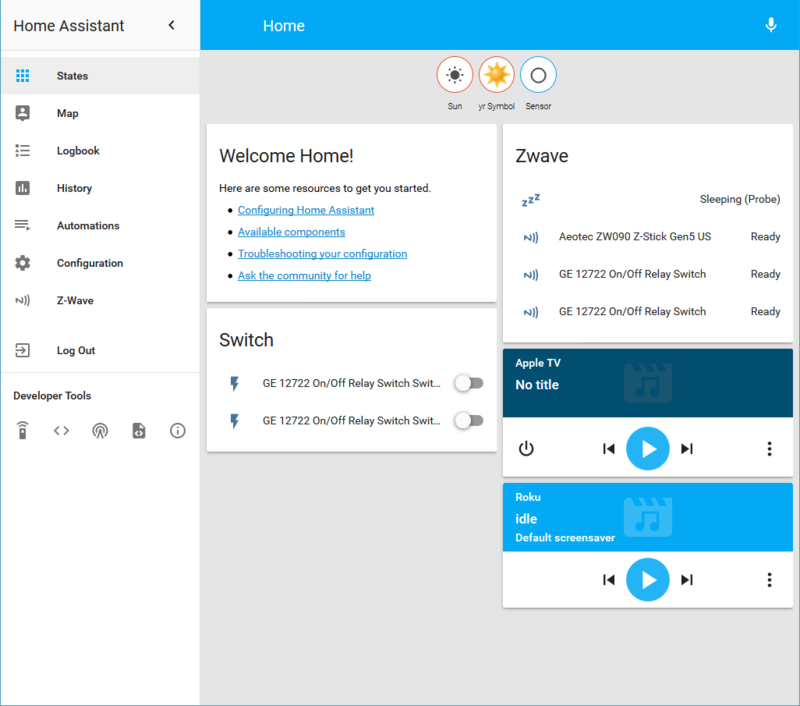 I hope this helps others who are just getting started with Home Assistant and Z-Wave. I did run into a couple more Z-Wave device issues that I’ll cover in more detail in a future blog post.